This chopsocky yarn contains moments of genuine invention courtesy of Sammo Hung‘s clever, if overly traditional, kung fu fight choreography, which seems to revel in an old-fashioned glee. Aside from the more obvious and clunky wirework, Sammo creates a throwback to the Shaw Brothers bloodbaths of old, throwing every weapon he can muster into the mix like Lau Kar-leung on a rampage. Benny Chan is a veteran of mainstream entertainment and keeps the film relevant, despite strong cinematic leanings towards not just kung fu films but also the wuxia tradition, Samurai movies and spaghetti westerns. The latter is the film’s most obvious reference point, not just in the Morricone-like soundtrack, but also the narrative construct which centres around the innocent, isolated Chinese outback village of Pucheng and the guardians who vow to protect it. The village becomes a microcosm of military oppression at a time of huge political instability in China, as the southern armies contend with warring factions elsewhere in the country, leaving smaller strongholds like Pucheng vulnerable to attack. The town is beset by the entitled, berserk son of a dissident general (played by Louis Koo), who indiscriminately slaughters some of the village folk without rhyme or reason. He is held hostage, which results in a visit from the general’s army and his chief protector, played by the kung fu whiz Jacky Wu in another one of his brilliant silent-but-deadly roles. Eddie Peng plays his former army buddy turned nemesis who has shunned society to become a wandering hick on horseback – an archetypal Kurosawa ronin – who warms to the Pucheng locals and vows to protect its values of compassion, equality and justice. 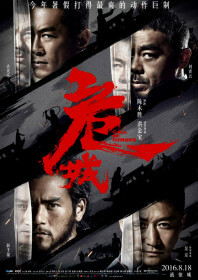 This doesn’t have the unabashed recklessness of Benny Chan’s Jackie Chan films, although it would work nicely as a companion piece to his fiery 2011 epic Shaolin, which not only dealt with the same time period but also revelled in similarly worthy themes of political resistance and egalitarianism. Also, like Shaolin, its a bit too long.